What's up since October 2010? Since last post, I have been invited in november 2010 to do visuals for Windy Hill Mill in Paris at the Gare Aux Gorilles. This was a great opportunity for me to update my live visual code to load arbitrary videos. QuickTime made it possible, on a very short schedule, to integrate full motion videos in my normal OpenGL setup. Unfortunately the place was not ideal for projections, and I ended up projecting onto the ceiling! Later in January 2011, I also played with my friends of Windy Hill Mill in Brooklyn, NY at the Invisible Dog gallery, bringing some parisian flavour to the show. My setup there was a monome 64 and the MLR sample manipulation program. You should check the photos! Also worth noting, I did the soundtrack for a short movie by Eva Pervolovici called “Danger de Mort.” A short clashing dreamlike photography with a facetious narration. Coaching programmers and would-be programmers has also been a very rewarding experience. I’ve been teaching some basics about audio/game programming in C, some methodology, and also been working to demystify the harmful abstractions used in the JSF2/J2EE world. Enterprise programmers’ typical schedule is hindering their progress: Integration, configuration, reading documentation may comprise as much as 70% of their time. Combined with harmful abstractions, this leads to cases of impostor syndrome. Rbrch is a contemplative piece with an aquatic theme. Each is about 1.5MB big and written in C. Both audio and visuals are generated. Just contact me if it does not appear to run properly. Requirements: SSE2, accelerated OpenGL graphics, an audio card. Although you really should download and run the executable. Rbrch was originally made as a gift for someone’s birthday. A demo meant as a sort of relaxing bubble, away from the urban greyness. Care was taken in making it work on most basic computers, hence the absence of shaders and an attempt at detecting how fast the machine runs the particle system during the initial blank screen. Uses the code base I cowrote for LN2’s. L’autre jour je voulait acheter une étagère. Chromée, bien brillante, sur roulettes, longue¹. Je vais a Habitat-Montparnasse, accoste un vendeur qui me dirige vers son bureau, et là on me déclare que je ne peux point l’obtenir. n’en avez vous plus en stock? si, mais suite aux travaux nous n’avons plus accès a notre entrepot. Alors moi, pas une pas deux, car j’avais la ferme intention d’avoir mon étagère le jour même (c’était le samedi suivant mes vacances et j’étais dans de bonnes dispositions) je leur dit qu’il n’est pas la peine de la reserver, quitte le magasin et me dirige vers la bouche de métro la plus proche pour aller a Habitat boulevard des Capucines. Là-bas je trouve l’étagère tant recherchée. La vendeuse m’interpelle lors de mon passage dans le magasin, puis me dirige fatalament vers le bureau approprié. Le vendeur en face me dit oui oui pas de probleme attendez nous allons la monter ici, télephonant a son collègue en sous sol. Ce collègue lui répond alors, dans un dialogue de sourd qu’il n’en voit aucune en stock, alors que le vendeur, en haut, en voit bien une sur son ordinateur. ¹ A noter que je me suis fait interpeler par un vendeur la première fois que je l’ai repérée, quand j’ai commis le grave crime de sortir mon appareil photo pour la capter pour plus tard. 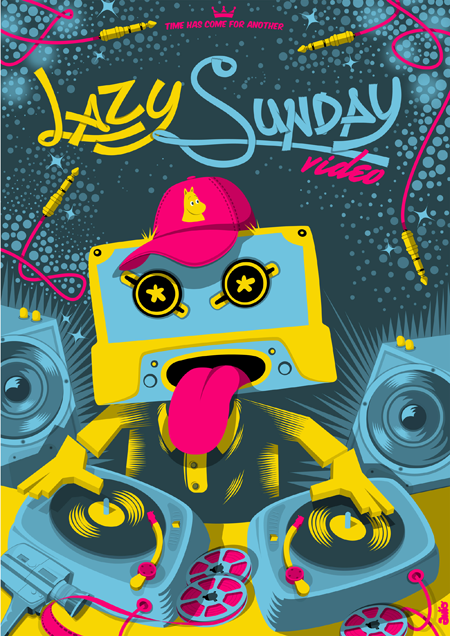 The TPOLM Lazy Sunday Video was an absolute blast, with lots of nice live performances and visual works. Esem’ music for instance felt satisfying on so many levels. Machinedrum’s was full of vigor. Sense’s and Frank Bolero’s were full of romanticism. Magic happened amongst the technical difficulties in the visual department. I was particularly curious about Nebogeo’s live coding with his programming language, fluxus. Magic also happened with the video signal manipulation devices that Jdigittl had built for the occasion. 2010-04-26, 2010-05-02: the lazy sunday radio (audio only, so) actually kept playing for a week, each TPOLM DJ handing the station over to the next one in a different time zone. The sunday never really ended. It was an honor and a great pleasure to do visuals on such a moody soundtrack.